The holidays are a time for great memories with your favorite people! It’s hard not to let this joy take over your life, and for many of us, it does. One of the places that we spread the most joy is within the walls of our very own home. From baking to decorating, it’s our homes that get the blunt force of the holiday joy that’s overflowing from our bodies! While there’s certainly no such thing as too many sweet treats during the holidays (in our opinion), there is such a thing as too much decorating. Sure, the colorful lights and decor are fun to see, but there is certainly a tasteful way to go about decorating during the holidays. At Rinehart Design Group, we too love decorating for the holidays, but there are certain pieces of decor that can leave your house looking cluttered and overwhelming. 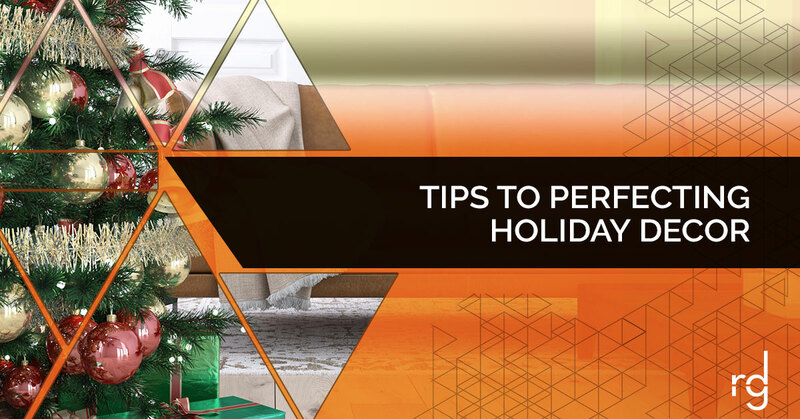 That’s why we’ve decided to focus on a few of the tips that can help you decorate this holiday season while ensuring it looks absolutely wonderful! There are so many different themes that can be incorporated during the holidays, the key is to choose one and one only. The common misconception of holiday decor is that it needs to be red and green, but that’s definitely not the case. Whether you choose blue and silver to go with a nice frosted tone or you pair gold and red to go with a warmer tone, you’re still tuning into the holiday spirit. The key, however, is to be consistent. Once you’ve selected a color scheme make sure that it’s incorporated into the decorations on your tree, the mantle, the gift wrap, and the additional decor that you have in your house. By doing this, you’ll be able to maintain a cohesive look while decorating for the holidays. There are a few different ways that you can bring in some of the outdoors in a tasteful way that also contributes to the overall feel of the holidays. Some of our favorite ways that you can bring the outdoors into your home are pinecones, branches, and hints of pine. These are all subtle hints of the weather outdoors, but they are also fantastic details to add to your decor. One of the best pieces of these little details is that you can mix them into your decor in so many different ways. Finding hurricane vases that show off the entirety of the branch or scattering pinecones on the mantle is a stylish way to enjoy the look and scent of these small features. While there are so many different types of decorations that you can put out, there’s no reason that you should be putting all of them out. Sure, it’s fun to let your decorations scream your love for the holidays, but sometimes you can let the lights alone do the talking. If you’re starting to feel overwhelmed by the number of decorations that you have out, feel confident knowing that you don’t have to have a bountiful amount of decorations in order for it to feel like the holidays. When it comes to the tree, turn on the lights and get a glimpse of how much they fill up your tree. Look at your dinner table and minimize the clutter so that all decor is just a subtle touch of the holidays. Taking small steps like this can ensure that the holiday cheer is present through and through while ensuring that it’s not overwhelming. The final point that we’re going to touch on takes us back to those sweet treats we mentioned at the beginning of the blog. A major component of making the holidays warm and welcoming are the sweet treats and candies that can be enjoyed all month long. If you’re looking for an easy way to make your house feel like the holidays, bake a delicious treat and keep it on display. Not only does having accessible treats warm your house up, they immediately welcome your guests when they walk in. From jars filled with candy canes to dishes that display freshly baked treats, this is an easy way to make your house feel, look and smell like the holidays. The team at Rinehart Design Group has a passion for design. We appreciate each individual that welcomes us into their home to and allows for us to contribute to the interior design. If you’re interested in learning more about how our team can assist you in achieving the interior design that you’ve always wanted, reach out to us. We’ll start out by scheduling a consultation where we hear your goals. From there, our team will come up with a plan of action and share that with you. In the end, we hope to provide you with everything that you’ve always wanted!